A sign posted in the Margaret Dow Towsley Sports Museum located inside Schembechler Hall. As much as I respect Michigan State as an opponent, I really don't get into the rivalry as much as others do. I'm from Ohio. Born and raised in Toledo, so I don't fully grasp the concept of a big-time in-state rivalry. Living in metro Detroit, I am surrounded by Spartan fans. They seem to gather here for some reason. They put big "S" stickers on their SUVs to signal to drivers behind them to watch out. They wear green only when they're team is doing well. And they don't shy away from letting you know they're MSU grads – almost to the point where it's annoying. No longer are the Wolverines delivering the punch lines around the water cooler, but taking them. Losses to Ohio State used to hurt the most. Now, if Michigan fans are truly honest with themselves, it’s the defeats to the Spartans which cut the deepest. Michigan State has become the Wolverines’ primary rival. Big Brother — Michigan — has become Little Sister. Mocked. Ridiculed. Oh where do I start? First of all, this is exactly why I don't listen to Detroit drive-time sports radio. It's crap like this that would have me screaming at my radio while other drivers stare in bewilderment. To me, this was written by someone who takes their position in the sports media way too seriously...or not seriously enough. I don't know Pat Caputo, so I can't say. But I can tell you from this Wolverine's perspective, he could not be more wrong. I'm sure to Spartania, Michigan is their biggest rivalry. Obviously. But to Maize & Blue Nation, it's always been, and will forever be Ohio State. Michigan-Michigan State is a big rivalry because Michigan State fans desperately want it to be, and are willing to go to any lengths of annoyance to make it so. From a strictly football perspective, Michigan and Michigan State are forever linked by their geography. Big time in-state rivalries are like that. They're typically one-sided in terms of all-time record – with the school with the "state" in their name being the inferior. Michigan State, Oklahoma State, Oregon State, Washington State, Mississippi State, Arizona State, Florida State - all second-class citizens compared to their in-state rival. I'm not picking on Sparty, it's just the truth. But I have to hand it to "little brother", they've capitalized, much like everyone else has, on Michigan's misfortune over the last three years. Michigan State has been able to make a series that is 67-31-5 with one of the worst rivalry-game trophies about as good as it can be. No one has benefited more than Mark Dantinio who just signed a 5-year contract extension worth a base of $650,000/yr. with bonuses, and a handsome buyout of $3.5 million should a certain school in Ohio want to woo him back after this season ends. In terms of this year, which we'll get into much deeper in our preview later in the week, Michigan State is one of the top teams in the conference. They have a mediocre offense, but a very talented defense. 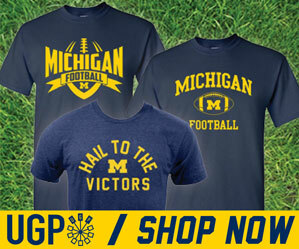 Now, they're capitalizing on the downfall of OSU, whom they beat 10-7 two weeks ago in Columbus. Seems like any top-tier B1G team that suffers does so to the benefit of Michigan State. There's something to be said for that, I guess. But the Michigan game marks the second of a huge four-game stretch (at OSU, Michigan, Wisconsin, at Nebraska) for this Spartan team which will define their season. If they get through this with only one loss (Wisconsin), they can book a trip to Indy for December 3rd. On the flipside – if Michigan beats Sparty, they can control their own fate as the team to beat for the Legends division. I'm getting ahead of myself here. We got a long way to go. But the second half of the season begins with a bang in East Lansing. And no matter how you feel about this rivalry, you can't discount the importance of the game itself. Michigan and Michigan State are the teams to beat in the Legends division. And the winner gets the inside track to Indy. First off, Michigan and Ohio State is the greatest rivalry in sports. As a Michigan fan, I don't consider the Michigan State rivalry to be bigger, but it's definitely gotten more intense than it previously was. Any Michigan fan who denies that hasn't been around Spartans long enough to get pissed off. Trust me, if you see these guys all the time, they don't shut up. I used to respect Michigan State, but they don't win respectfully. They don't acknowledge that it was a good game, and that Michigan was a good opponent. They just rub the victory in like douche bags. Couple that with Dantonio's statements. Dantonio was asked in 2010 if he would root for Michigan in the UM-OSU game, because if Michigan won, MSU would win the Big Ten title outright. Dantonio said he didn't care and that he wanted Michigan to lose anyway, even if it meant the Spartans wouldn't go to the Rose Bowl. Now THAT'S hatred! You should at least root for what's best for your team, but Dantonio didn't. Bottom line, Brad, is I don't think anyone is suggesting that UM-OSU is second to UM-MSU. I think Caputo is suggesting that the Michigan State rivalry has become far more personal and far more intense for people living in Michigan. And a quick note on the rivalry trophy. I don't think it's ugly at all. I think it's glorious! In fact, it's my favorite rivalry trophy in college football, but that's probably a local bias. I mainly think it's glorious because the team who has it OWNS the state of Michigan. Again, if you're a person from Michigan, that means a lot.